Not the kind of cow pie you'd expect! Wordplay elicits some serious giggles and is a great way for kids to explore their creative sides. Introduce them to the richness of figurative language with these fun coloring sheets featuring zany, literal depictions of common animal idioms and sayings. Give this moo-cow her voice back, and create your own cow paper bag puppet! This arts and crafts project is a great way to boost fine motor skills. How does this cow know how to ice skate? Give your child some creative writing inspiration with this fun coloring page. This pie chart is missing some data! Give your little one a fun activity with this blank pie chart, which introduces her to fractions and the idea of graphing. In this worksheet, Floyd demonstrates the Cow Pose. Kids can color in the picture, and practice this yoga pose along with him. Introduce your little math learner to the idea of graphs, and even fractions, with this blank pie chart. This one is split into thirds! For little math learners, here is a blank pie chart that needs to be filled! Have fun introducing your child to the idea of graphs, and even fractions. 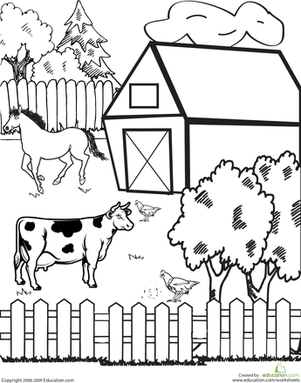 It's a farmer's life in this farm coloring page, which features a cow and other farm animals. These pizza fractions look a little like pie graphs, but they're perfect for helping your child visualize his fractions. Keep the Thanksgiving can't-waits at bay by crafting your own miniature paper feast, complete with turkey, mashed potatoes, and pie!